For the hiking trail along the divide, see Eastern Continental Trail. A map of the principal hydrological divides of North America. The Eastern Continental Divide (orange line) demarcates two watersheds of the Atlantic Ocean: the Gulf of Mexico watershed and the Atlantic Seaboard watershed. The Eastern Continental Divide or Eastern Divide or Appalachian Divide is a hydrographic divide in eastern North America that separates the easterly Atlantic Seaboard watershed from the westerly Gulf of Mexico watershed. The divide nearly spans the United States from south of Lake Ontario through the Florida peninsula, and consists of raised terrain including the Appalachian Mountains to the north, the southern Piedmont Plateau and lowland ridges in the Atlantic Coastal Plain to the south. Water including rainfall and snowfall, lakes, streams and rivers on the eastern/southern side of the divide drains to the Atlantic Ocean; water on the western/northern side of the divide drains to the Gulf of Mexico. The ECD is one of six continental hydrographic divides of North America which define several drainage basins, each of which drains to a particular body of water. The divide originates at the Eastern Triple Divide(see sidebar) near the middle of the northern border of Pennsylvania then runs generally south-by-southwest following the crest of the Appalachian Mountains through Pennsylvania, western Maryland, West Virginia, Virginia and North Carolina to its high point on Grandfather Mountain (Though Mount Mitchell is the highest point in the Appalachian Mountains, it is not on the ECD, but 4 miles west of the ECD), then descends  to the city of Atlanta in northwestern Georgia, where it doglegs southeasterly across the Georgia plateau and through the lowlands of Northern Florida to its terminus in central Florida at the northern boundary of the Lake Okeechobee Basin(see sidebar). Though the divide is often associated with high elevation, at its southern terminus at the northern Kissimmee River watershed in Florida, the elevation is only 70ft. above sea level. Nor does the divide always coincide with the highest point or ridgeline, because streams can flow through passes or gaps in the ridge, so that terrain on one side of the ridge drains to the other side and therefore to the other watershed. This occurs in several places. The ECD is not completely fixed, but can shift due to erosion, tectonic shift and also anthropogenic activity such as tunnel excavation, damming of rivers and road construction. In colonial times, except for Spanish Florida, the ECD served as the boundary between English colonies on the Atlantic seaboard and Indian lands to the interior. The Eastern Triple Divide[a] is the northern terminus of the Eastern Continental Divide where it intersects the northeasterly St. Lawrence Divide near the middle of the northern border of Pennsylvania. That point divides the eastern United States into three watersheds, where the associated nearby headwaters form the Pine Creek tributary of West Branch Susquehanna River that drains to the Atlantic ocean, the Allegheny River tributary of the Ohio River that drains to the Gulf of Mexico, and the Genesee River tributary of Lake Ontario that drains to the Gulf of Saint Lawrence. The Eastern Continental Divide originates in the north at the Eastern Triple Divide on the summit named 'Triple Divide Peak' 10.4 mi (16.7 km) south of the New York-Pennsylvania line about 5 mi. southwest of the borough of Ulysses in Potter County, Pennsylvania. That summit is the northernmost peak of three atop a broad plateau which is currently farmland. From there, the ECD runs south-southwest through the two nearby southern summits then southwesterly along the Allegheny Plateau west of the Allegheny Front until[where?] it plunges south along the Appalachians barrier ridge. Mount Mitchell State Park in North Carolina is the highest point on the ECD at 6,366 ft (1,940 m). As the altitude of the peaks diminishes across the swampy Georgia plateau the divide meanders into the low country of Northern Florida until it reaches central Florida, ending at the north bank watershed of the Kissimmee River. While notionally, the ECD may be considered to extend to the southern tip of Florida, south of Lake Okeechobee the everglades, which spans the length and breadth of the peninsula, is a seasonal swamp which drains into the lake. During the wet season, overflow from the lake forms an unchanneled "river" 100 miles long and 60 miles wide that flows south to Florida Bay which ostensibly drains into the Gulf of Mexico, but due to mud dykes, little exchange of water actually occurs. So hydrographically, the only divide in southern Florida is between the lake and the ocean or Gulf, and that divide is coincident with the boundary between land and sea. Because the divide represents the highest terrain, air is forced upwards regardless of wind direction. This process of orographic enhancement leads to higher precipitation than surrounding areas. In winter, the divide is often much snowier than surrounding areas, due to orographic enhancement and cooler temperatures with elevation. Some locations in North Carolina average up to 100 inches (2,500 mm) of snow a year, and up to 175 inches (4,400 mm) a year falls in parts of West Virginia. The Lake Okeechobee drainage basin in south central Florida, including the Kissimmee River drainage basin to the north which feeds it, was naturally or hydrographically, an endorheic basin, one which does not have outflow to another body of water like a river or ocean. Such a basin may form a swamp when water collects. It was altered by anthropogenic activity, specifically the construction of the Okeechobee canal in 1937 which spanned the Atlantic Ocean, the lake and the Gulf of Mexico. Nonetheless, it is not considered by hydrologists to be part of either the Gulf of Mexico watershed or Atlantic seaboard watershed. 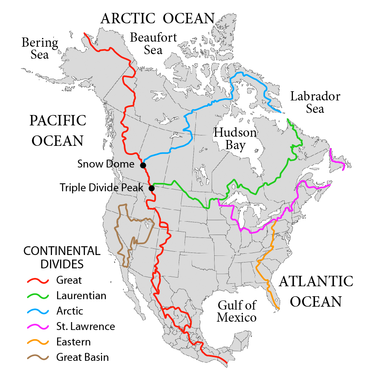 The northern boundary of the basin[b] is the southern terminus of the Eastern Continental divide. Prior to about 1760, north of Spanish Florida, the Appalachian Divide represented the boundary between British and French colonial possessions in North America. The Royal Proclamation of 1763 separated settled lands of the Thirteen Colonies from lands north and west of it designated the Indian Reserve; the proclamation border ran along the Appalachian Divide but extended beyond its Pennsylvania-New York terminus north into New England. 38°53′31″N 79°28′04″W﻿ / ﻿38.892050°N 79.467781°W﻿ / 38.892050; -79.467781 Saddle Point at Pendleton County and Randolph County. Georgia: Atlantic Seaboard fall line [specify] near Macon, Georgia, this intersection is a triple physiographic point of the Piedmont (to the north) and the Gulf & Atlantic coastal plains (southwest & southeast). ^ "Triple Divide". Geographic Names Information System. United States Geological Survey.